Market Street Trust Company, a wealth management company in Corning, NY, and its employees committed numerous hours to charities over the holidays, helping the local chapters of both the Salvation Army and Meals on Wheels with fundraising and volunteer work. 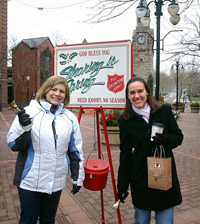 Market Street employees rang the familiar holiday bells for the Salvation Army in the downtown Corning area and also helped prepare meals and emergency food bags for families in need for Meals on Wheels . "As a company that has been in the community for over 100 years and is so closely tied with it, we are pleased to be able to spend some time giving back," said Market Street Trust President Marianne Young. "We have extraordinary affection and devotion to the greater Corning community." Market Street has also established "Casual for a Cause," a program which supports a different charity one day every month through donations made by Market Street employees for the privilege of wearing jeans on each "Casual for a Cause" day. Founded in 1909 and based in Corning, New York, Market Street Trust Company is a family office providing comprehensive, attentive wealth management services for high-net worth families, many of them spanning multiple generations. Market Street is a private trust company, offering the permanence and objectivity of a corporate trustee, as well as the flexibility of a highly personalized approach. Market Street Trust was the winner of Private Asset Management's 2012 Award for Best Multi-Family Office for Client Service, in the sub-$2.5 billion category and was recently nominated again in this category for 2014.